The Address Dubai Marina if the perfect resort for guests who desire both relaxation and excitement. Overlooking the crystal waters of the Dubai Marina and within walking distance of Jumeirah Beach, you will have time to enjoy peace and serenity in a beautiful setting. The hotel's fourth floor infinity pool boasts the best views across the marina. Alternatively, the dynamic district, in which hotel is situated, hosts some of Dubai's most renowned leisure clubs, shopping malls, souks and at night, there are many sophisticated clubs and lounges to choose from. Downtown Dubai and the Burj Khalifa are a short drive away. Rooms are immaculate, incorporating soft colours and luxurious textures. Unspoilt views of the water, marina or city can be seen from the floor-to-ceiling windows. Guests staying in the Grand Rooms of Premier Suites will benefit from additional services such as complimentary airport transfers, a separate business room and free shirt pressing. The hotel's restaurants and lounges serve a variety of international cuisines. For an energising atmosphere, you can see your food cooked in front of you in one of Mazina's show kitchens. Shades and Blends are stylish, contemporary venues offering a fine selection of champagne, wines and cocktails, perfect for an evening out with friends. Located on the third floor, the hotel's spa has 12 treatment rooms, each with enchanting views of the marina. With a menu of signature treatments available, beautiful shower facilities, a sauna and steam baths, the spa is tranquil and peaceful. Other facilities include a 24 hour Fitness Centre that is packed with state-of-the-art cardio and weights equipment. Personal training sessions are available, with one of the hotel's qualified personal trainers. Children between 5 and 12 will be endlessly entertained at the hotel's Qix Club. The club has a range of facilities from climbing walls to PlayStations. 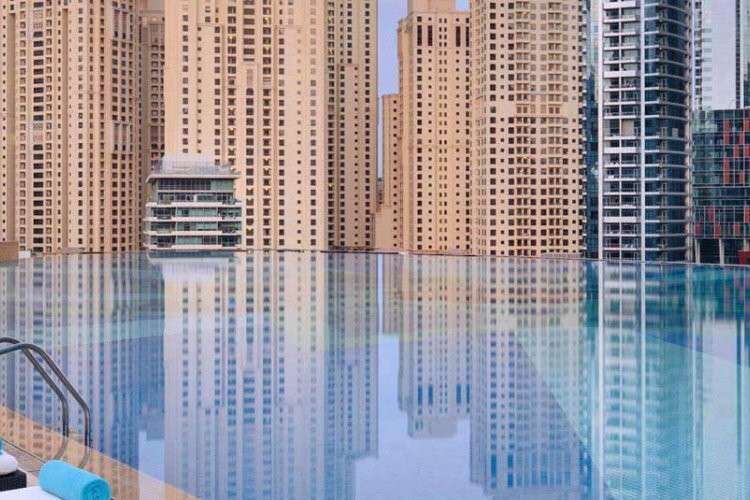 In addition, The Address Dubai Marina has a separate children's pool.